Part I, the history of the turbulent beginnings and continued relationship of psychology and psychical research, can be read by clicking the link. Part II concerns where we are now. And because what follows is recent enough that a historical perspective or light cannot yet be shone upon it, several examples will have to suffice. In all of these, parts of the "evidence" offered may be dismissed, but perhaps some parts kept, in our search for a common thread, and more importantly, tools that serve us in meeting The Challenge. Part II begins with this link to a style of medical practice, which the participants introduced by Part I would have shuddered at. At a minimum, hoping that such charlatanism would never have come into being. Yet here we are. Here it is. It exists. It is now embraced by a major University's Medical Center and System. It is not only, not charlatanism, but it works for it's patients/ clients/ participants (select your favorite term for those seeking compassionate care). Imagine: a Center for Integrative Medicine. Recall that the introductory subject was "telepathy," and that the overarching or foundational subject is: Send(ing)ThemPeace. So, ... what do we use to meet The Challenge? Our brains. Some will argue quickly: "No! We let our brains go to sleep and use our hearts. Our hearts send and receive compassion!" While appreciating the sentiment, instructions like: "Quiet your thoughts. Rest in the Present. Focus on your breathing and mantra," would seem to involve the brain at least just a little bit for starters. And in fact involving the brain probably even longer than initial phases of sitting (zazen), as one gets locked in (in a good sense), to one's practice. understanding functional characteristics of thinking, to be able to meet The Challenge? Perhaps not, on the one hand. On the other, applying anything learned about how the brain perceives, decodes, and processes during The Challenge,... might be of use, so why risk losing that possibility? Was the science good? Not bad, though some object that the "non-telepathist" control might have had some unknown telepathic skills. Of course: "How does he do that?" The telepathist can do this repeatedly, but says he doesn't know exactly how he does it. Since telepathy is the ending or receiving of thoughts from another being in the absence of sensory input, the focus shifts quickly to,... "Gee, that's a pretty good trick. Could I learn how to do that? Could knowing how to do that help me send compassion to other individuals during The Challenge?" Wouldn't that be interesting and perhaps useful? "Say, what does that parahippocampal region that "lights up" during telepathy, do anyway? I mean, ... usually?" Now that you've seen it, what does the parahippocampus do? Even as recently as 1976, when my professor of Neuroanatomy would explain how a given gyrus had come to be named, knowing what it did was beyond him. So the parahippocampal gyrus, of course, means "one of the circular bumps on the brain surface (gyrus) that is located right next to (para) that other bump that looks like a seahorse (hippocampus)." Dr. Johnson rarely forgot to add, his hands in the air: "Why? ... we do not know." It did not take long for our class to learn to anticipate and repeat this phrase in unison, à haute voix, though that answer never seemed to suffice on the exam. Brain function was first studied by neurologists and neurophysiologists in the setting of brain injured beings (humans by accidents or illness, and usually rats or mice, but also others, intentionally injured in the lab). 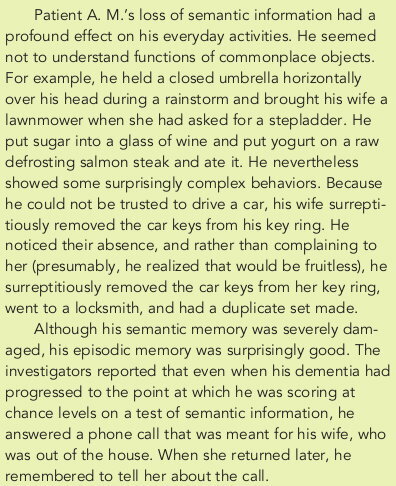 Examples of how loss of a specific region of the brain (assuming a non-lethal accident of course), can produce amazing (and let's not forget to include, sad...) results in human behavior and faculties,.... have been collected by Oliver Sacks, MD in his book: "The Man Who Mistook His Wife for His Hat." One example out of many, you can read here in the account at right. As students, someone would eventually, invariably ask: "What is the treatment for that?" And the professor's answer was almost invariably: "Not a thing. There is no treatment. Let's move on." And thanking the patient, we moved on. 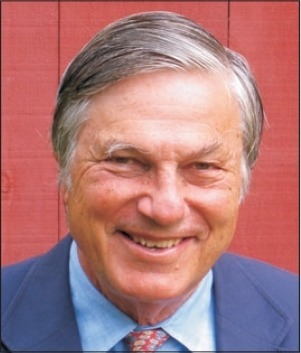 And if the professor's answer seemed to some to lack compassion, he still remained courageously in this difficult field of medicine, caring for those with often catastrophic results of accidents and illness, and had learned to not waste his compassion, saving energy instead for those where infrequently, treatment was possible. My thought at the time was that the untreatable patient still needed and merited compassion as well, done however one could. But we moved on. So if telepathists "turn on" their non-dominant parahippocampal gyrus, what is it doing, even if they don't know it at the time? If a patient "loses" this region of the brain through a very localized stroke (loss of blood supply), what is the result? Fortunately, waiting for an illness or injury to knock out an area of brain and its function, as a means of learning more, has been one upped as a learning tool. PET (positron emission tomography) scans and functional MRI (fMRI) have added immensely to structure-function-location studies of the brain and human cognition. Luzzi (2000) reported a man who had a non-dominant (right-sided in the brain) loss of the parahippocampal gyrus. The patient lost his ability to find his way around a new environment. Lesions produced in rats create the same result. So visuo-spatial processing is now out of whack. But in other patients, in addition to getting lost, episodic memory was also affected or completely wiped out. Episodic memory is the memory of autobiographical events (times, places, associated emotions, and other contextual who, what, when, where, why knowledge) that can be explicitly stated. It is the collection of past personal experiences that occurred at a particular time and place. One might ask: "How, or why, do these two functions go together." The PHG seems to be involved in many different functions and to act in concert with many other regions to accomplish those functions. Its physical location, places it not in that outer and more recently enlarged cortex, but deep within the brain. This is where neurons that assure functions essential to life since we crawled out of the swamp, are conserved and protected. A lizard, a mouse, an ape, a human, (and anatomical comparisons should be made with caution),... all have a PHG hidden deep, deep inside. And while it may seem uniform on its surface, the PHG can be divided into different zones of neuronal function. Some respond to visual stimuli, some odor stimuli, and some auditory stimuli, taking part in emotional reactions to these stimuli as well. Here are quotes from an article (Aminoff et al., 2013) that you can download as PDF by clicking the link. In what follows PHG is also abbreviated PHC, parahippocampus. "An overarching account was proposed, whereby the PHG is part of a network of brain regions that processes contextual associations. Contextual associations are the principal element underlying many higher-level cognitive processes, and thus are suitable for unifying the PHG literature. Recent findings are reviewed that provide support for the contextual associations account of PHG function. In addition to reconciling a vast breadth of literature, the synthesis presented expands the implications of the proposed account and gives rise to new and general questions about context and cognition." "PHC has been correlated with viewing pictures of scenes and landmarks, using spatial maps, and remembering locations of objects [16,22,23,35,36]. Strong activations in the PHC in response to scene stimuli led to naming the posterior region of the PHC the ‘parahippocampal place area’ (PPA) in an early study of neural correlates of place perception . Further evidence was provided by studies of patients with damage to the PHC, which impaired their visuospatial processing. These patients were impaired in landmark identification, spatial orientation, navigation, and spatial memory [37,38]. Finally, there have been a number of studies showing a direct link between the posterior parahippocampal regions and spatial processing in both rodents and in monkeys, where damage to this region selectively impairs visuospatial processing [39,40] However, what the PHC is actually computing in visuospatial processing is still unclear." "Mullally and Maguire  proposed a spatial defining hypothesis that suggests that the PHC is sensitive to the experience of ‘basic 3D space’. In this view, single objects can evoke a sense of 3D space devoid of other objects, spatial layout, or any contextual elements, and that this ‘sense of space’ is the optimal stimulus for the posterior PHC. Others have suggested that the PHC processes the expanse of space [20,21]: for example, resolving that a mountain range is an open expanse, whereas a cave is a closed expanse. These related theories are intriguing, although they target only what the PHC may be processing, but not how or why it is processing this information. Furthermore, none of these accounts attempts to reconcile spatial processing, episodic memory, and the other functional claims within the same PHC." "A large body of literature has explained PHC activity as dedicated to the encoding and retrieval of episodic memory. It is relevant to keep in mind that an episode is associative in nature, linking objects, relations, places, sounds, and more, in a single compounded construct. Indeed, associative memory, the memory that links different items together (e.g., face-name), rather than memory for a single item, is found to activate the PHC [14,39,44-49]. Thus, the PHC is not involved in just any type of episodic memory, but memory-related processing that involves associations between elements. In some cases, the PHC is involved in binding a target item with the surrounding context, compared with just remembering the target alone [14,50,51]. This context can be in the form of other items presented with the target item, background scene information, or a particular frame of mind (e.g., a task being done at that time). Such contextual information may provide “source” memory details (i.e., details about the specific episode; [14,15,45,52]). It has been proposed that the PHC provides to the hippocampus the contextual information about the where and when of a target item for memory encoding [53,54]." "Organizing stimuli based on contextual associations provides an axis (i.e., from strongly contextual to weakly contextual) to characterize stimuli along this continuous gradient. This provides a way to define what stimuli are “optimal” to activate this region without using strict categorical boundaries. Moreover, some categories can elude classification. For example, what exactly is a scene? For something to be considered a scene, does it have to depict a navigable place, or just a configuration of parts? Would keys on a keyboard be considered a scene or an object? Characterizing stimuli based on their contextual associations circumvents these definitional problems, and allows them to not necessarily fit specific categorical boundaries. Cutting-edge computer vision algorithms in scene understanding are not able to achieve anywhere close to the human processing, largely due to the lack of ability to process context. Context has been shown to significantly help computer vision models of scene understanding . Scene processing should not be thought of as exclusively a visual process, but rather a highly associative process that invokes prior experiences and context frames. "However, tasks involving contextual associative processing increase the activity of these regions (PHC & RSC) above their already high resting baseline, rather than deactivating them, which suggests that these regions are engaged most when processing contextual associations . At rest, or at baseline, humans’ thoughts do not cease, but rather engage in typical, active “mind-wandering” , which requires concentrated efforts (such as meditation) to quell. Mind-wandering engages associative processing, such as a free-association train of thought. Thus, this default network doesn’t overlap with the regions that process contextual associations by coincidence, but rather necessarily so, because contextual associations are a critical component of the thought processes occurring at “rest”." Of course, none of this explains what the telepathist is doing. But it does suggest that science is now more closely interested, and quite objectively so. Has an era, and this beyond mutual tolerance, of cooperation emerged between still unexplained psychical phenomenon, psychology, and other disciplines of brain science? You recall perhaps, an article written here on monkeys, who used their minds to move things in space. The researcher responsible for those monkeys, (Miguel Nicolelis) who's goal is primarily independent movement for paraplegics by transducing their thoughts into movement of sensor-equipped exoskeletons, ... These are Brain-Machine Interfaces. This neuroengineer also mentions another term: brain-to-brain communication (B2B). Does that sound like telepathy? While still a distant reality apart from exciting but rudimentary laboratory experiments, B2B is close enough to be causing effects and repercussions. Researchers like Bernard Perbal and others concerned with its development, are starting to formulate approaches to address the ethical issues of B2B. While this is referred to with astronaut words like : "a giant step for mankind," the possibility of harm coming out of this Pandora's Box is also presented as being very real. "In a world where people want to communicate information about themselves, about their lives, about their aspirations, about their problems and much more, the potential societal impact of non invasive « mind to mind » communication is huge and cannot be set aside to be addressed by the next generations." JB Trimper et al. share similar concerns about Brain-To-Brain Interfaces, as summarized here in the Conclusion of their paper, "When I Become We." "Recent advances in brain interfacing technologies now allow for direct communication between two individuals' brains (Pais-Vieira et al., 2013; Yoo et al., 2013). To date there is no legislation regulating informed consent and protecting personal data extracted via BCIs, much less BTBIs, either therapeutically or outside of the clinical and research context. Further, no formal protocols are in place for how to conduct research using these technologies, with humans or non-human animals. These studies continue to advance; recent unpublished preliminary data by researchers at University of Washington mark the first human to human BTBI, utilizing non-invasive EEGs and transcranial magnetic stimulation. Further the non-invasive nature of these technologies, the ease of engineering the relevant hardware, and the enthusiastic DIY culture interested in cognitive enhancement make exploring these ethical issues especially pressing. Ethical discourse around BTBI must keep pace with the advances in technology in order to prepare for possible life-changing implications of BTBI use. We have seen the public uproar and subsequent opposition to technology, as with mammalian cloning with Dolly, when there is a failure to prepare the public for such innovation (Wolpe, 2006). 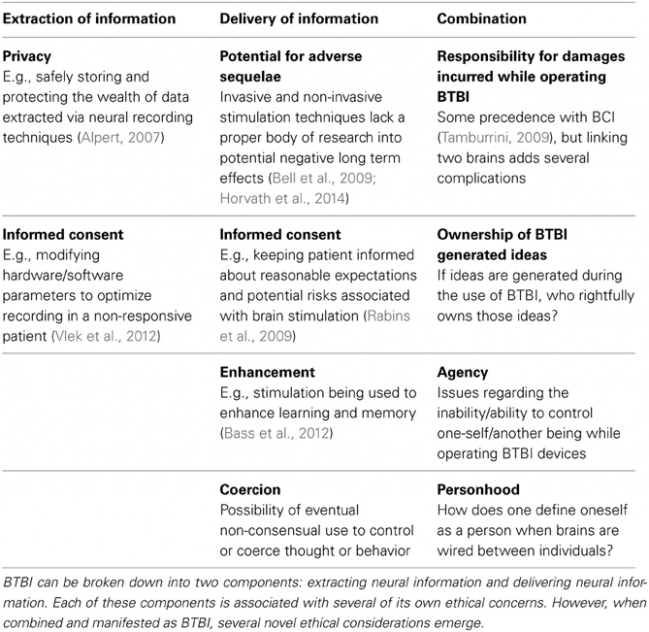 In order to best prepare the public to understand the implications of BTBI, ethicists and scientists must work together to ensure that the technology is developed with the highest ethical standards." Such concens would not be voiced for long, nor carefully thought through and organized, if the transition to BTBI, rather then being sensed as real, present, or imminent, was felt instead to be a century away. Can The Challenge here at SendThemPeace.com be viewed as a Brain-To-Brain Interface? Imagine: 5,000 individuals, applying a still evolving methodology to send a message of Compassion and Peace to a soldier half-way around the world that intends : "put down your automatic weapon. Go home. You are needed there." ... and he does. Is that a collective Brain-To-Brain Interface, and are there ethical concerns? Some would respond: "Oh, just do your 20 minute meditation, and don't worry about it." 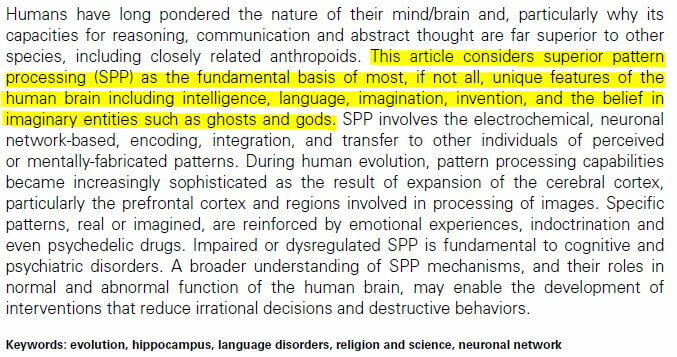 Again, the real point here is to point out that the past attitude (see Part I) of psychology and its science towards consciousness and "psi" phenomenon, represented here by "telepathy" but also including phenomenon like "Distant Healing," now seem to have the full attention of Science as entities to be fully accepted, understood and mastered. We are living a quite impressive time of scientific transition, shift, evolution. The apparently evolved attitude of mainstream science, at least currently, will not always present conclusions that fit perfectly, nor easily, with what "Spirituality" has "known for centuries," and as expressed in various traditions. Nevertheless, if one can, as advised above, extract what is useful for our goal here in meeting The Challenge, all the better. Avoiding a reversal of prior bias and scientific bigotry, avoids also throwing out the baby with the bathwater. The above article certainly merits being read. Some will find certain conclusions (such as the existence of "God" as one example of magical thinking, with elements indestinguishable from certain psychiatric illnesses, and contributing to much of humanity's current difficulties ...), as difficult to to find value in. Other observations, such as the great importance of powerful emotional experiences as effective contributors to the process of superior pattern processing and everything that goes with it such as intelligence, imagination and invention, ... will be more potentially useful. Unfortunately, Mattson throws out beauty with his selected example of William Blake's art as magical "God" thinkiing, which he takes as yet another example of psychiatric disorder. Even if at the time this was published, Mattson had not discovered how to identify Spirit in himself and others, one can certainly hope that this can still change with time. Here we'll simply underline : emotional experiences as effective contributors to awareness becoming thought, becoming action. He includes telepathy in that same list of imagined reality arising from magical thinking. Many of his contemporaries would not be in agreement. "This paper proposes that eight positive emotions: awe, love (attachment), trust (faith), compassion, gratitude, forgiveness, joy and hope constitute what we mean by spirituality. These emotions have been grossly ignored by psychiatry. The two sciences that I shall employ to demonstrate this definition of spirituality will be ethology and neuroscience. They are both very new. I will argue that spirituality is not about ideas, sacred texts and theology; rather, spirituality is all about emotion and social connection. Specific religions, for all their limitations, are often the portal through which positive emotions are brought into conscious attention. Neither Freud nor psychiatric textbooks ever mention emotions like joy and gratitude. Hymns and psalms give these emotions pride of place. Our whole concept of psychotherapy might change if clinicians set about enhancing positive emotions rather than focusing only on negative emotions." "This article suggests that spirituality reflects positive emotion. Spirituality, like positive emotions, is generated by the limbic system and is more about us than me. We do not have to be taught positive emotions; our brain is hardwired to generate them. Humanity's task is to pay attention to them, for they are the source of our spiritual being and the key to our cultural evolutionary progress. Spirituality reflects humanity's evolutionary press towards connection and community building even more than it reflects humanity's need for solace and revelation. Although positive emotions have been profoundly neglected by the modern social sciences, organized religions, for all their limitations, have helped to bring positive emotions into the ambit of conscious reflection. The Buddhist ideal is that of the bodhisattva - one who elects voluntarily to stay in this world and to help others, rather than entering directly into nirvana. Nor is spirituality trivial; if one follows the lives of history's great spiritual exemplars, they have always been community builders, not navel gazers." Some current authors do manage a less harsh rapprochement of the Scientific and Spiritual Realms. "Intuitive Intelligence, Self-regulation, and Lifting Consciousness"
... provides one such example. I think you will enjoy reading this work. And if time, here by the same authors is an offering on The Global Coherence Initiative. It makes for compelling reading as well. "The studies demonstrating that a relatively small number of the population who are intentionally meditating to create positive benefits supports the hypothesis that humanity is connected via a global field. Hence, we believe that the scientific research investigating how we are both impacted by the earth’s energetic fields and the potential for detecting effects of collective human emotion and intention in the field environment is an important aspect of the GCIs goals. However, even if we are not able to prove the encoding of human intention in the global fields in the next few years, we are confident that we can facilitate a deeper understanding of the mechanisms by which human health and behaviors are modulated by the earth’s fields and further clarify which aspects of the field environment mediate the varied and specific effects. More important is GCI’s primary goal, which is to motivate more people to work together in a more coherent and collaborative manner to increase harmony in the collective consciousness to alleviate social conflicts and to improve the environmental impact we have on the planet and assist in planetary evolution. and returned to SendThemPeace.com and The Challenge.